This entry was posted in Local business, People and tagged Tommy Ghianuly. Bookmark the permalink. 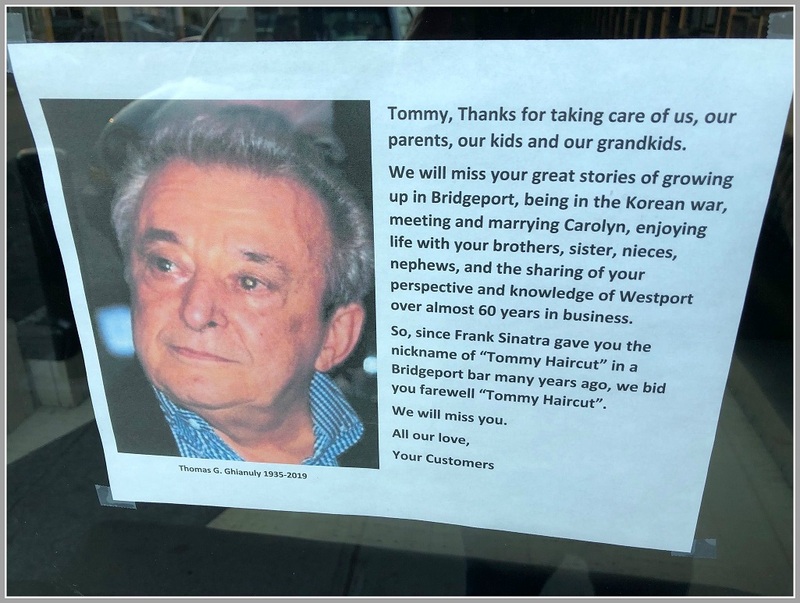 Tommy was truly a saint. Truly a very special guy. My sung hero. He was my barber during elementary school days thrown the ‘60s and he styled my hair on my wedding day in the 80s! I learned about all the Marvel superheroes through his many comic books waiting for my haircuts! Is this the man you said was a rabid Trump supporter? What’s wrong with you? This is a tribute to a man known and loved by so many people in this community and you have the audacity to bring up politics!? Tommy was always diplomatic. I only heard him comment on Trump’s hair which he thought he spent too much with. You should hang your head in shame. Tom was a fantastic person. You didn’t know him from your remark. Pathetic for you to comment on his tribute page. Tommy, was a credit to the human race. He exemplified all that is good and I think all that knew him are better for it. This man had a small business and stayed in business for over 50 years. This alone shows how Westport through many generations loved this man.